Another month and yet another big-screen movie adaptation. 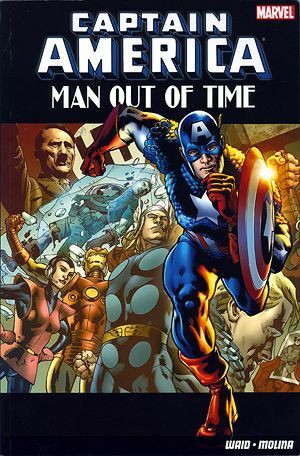 Captain America is a peculiarly old-fashioned character, the US embodied in a patriotic soldier who risked his life taking the ‘Super Soldier Serum’ to become the ultimate warrior. He fought during WWII until becoming frozen in time saving the world, only to be thawed out years later. And that’s where we pick up the story: Steve Rodgers has just been revived and is understandably having some difficulty getting his head round leaping forward in time by several decades. It’s an aspect of Cap’s character that’s already been covered several times before as he adjusts to ‘the future’ and joins the Avengers. The art is nice but unexceptional, similarly the usually reliable Mark Waid feels like he’s coasting when it comes to script duties. As an introduction to the modern itineration of the character it’s a good entry point, but it could do with a touch less flag-waving sentimentalism.